To Your Health: 4) DO YOU HAVE HIGH CHOLESTEROL? Everyone has cholesterol. The question is how high or what is the ratio of HDL (good) and LDL (bad cholesterol) in our bloodstream? I have been taking cholesterol pills for the past five years until now to lower my bad cholesterol level but the last blood test reading showed that it was still on the high. So what can I do? On March 11, 2012, my hubby sent me an email with this story. A man was diagnosed to have three blocked arteries and needed surgery. Someone told him about an all natural concoction that could help clear the arteries. The ingredients were garlic, honey, apple cider vinegar, lemon and ginger. For a month he consumed a daily dose of one tablespoon. On his next medical check-up, his doctor was surprised to find that his arteries were not blocked anymore. The man then shared the before and after Angiography images of his arteries as proof that the remedy really worked. After reading the story, my hubby and I followed the preparation steps closely to make the first batch. We kept it refrigerated for freshness. Did you know that honey is a natural preservative? Both of us took the dosage every morning before breakfast without fail. Initially, I found the garlic odor quite pungent but as the days passed, I hardly noticed it. Just remember to rinse out your mouth with water or mouthwash. I say this because one morning, my dear hubby had taken the juice and I have not. When he passed me by, a strong odor liken to a sewage drain wafted to my nose. So, be sure to rinse unless you do not mind starting your day smelling like a mobile sewage drain! The problem is the people you come in contact with, do mind. The smell of garlic is evident. The after taste has a lemony tang, mellowed by the sweetness of honey. When swallowed, a warmth sensation from the ginger juice radiates slowly from my chest to my stomach as it traveled down my throat. Refreshingly tasty. 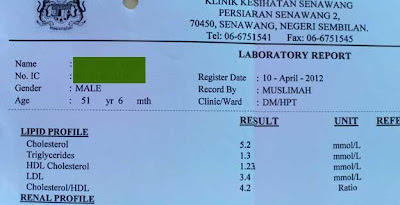 My hubby had done a Lipid Profile blood test on January 26, 2012. He has been taking the juices since mid-March 2012. He did a second blood test on April 10, 2012. 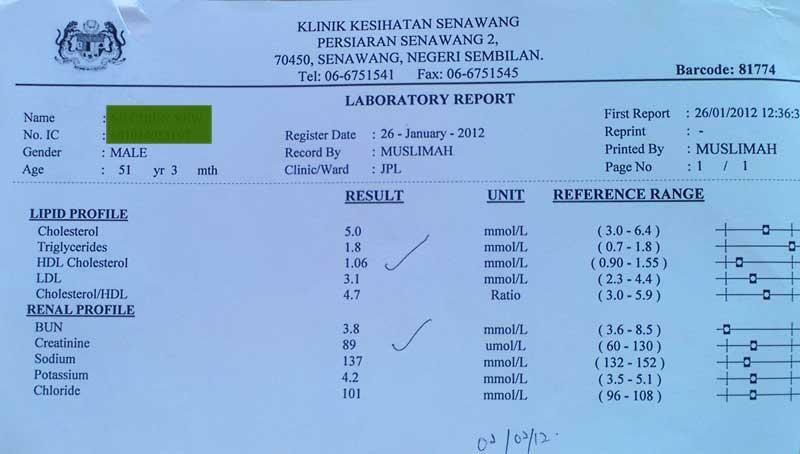 As you can see from the reports, his HDL (good cholesterol) increased from 1.06 to 1.23. Now, even though the LDL (bad cholesterol) has increased from 3.1 to 3.4, the overall ratio of cholesterol over HDL has decreased from 4.7 to 4.2. Please note that the triglycerides has also decreased from 1.8 to 1.3. From the results, it is evident that the combination of these pure juices are truly effective! And he has only been taking the juices for less than a month. I think that the benefits are far reaching. Because of the efficacy, our heart and arteries can function efficiently even as we age. When a person suffers a heart attack, it is either a quick death sentence or a painfully slow recovery. Some will experience a full recovery. For others, a partial or complete paralysis. The bottom line is, "Prevention Is Better Than Cure." 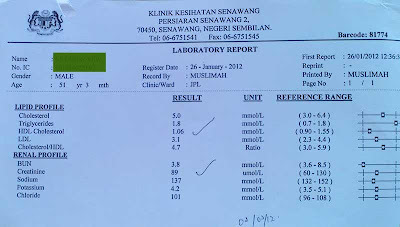 I have also done a blood test on January 26, 2012. However, my appointment for a second blood test is only due in June 2012. So until then, I will continue to take the juices daily. About a month ago, my friend's husband who was only 54, suddenly suffered a heart attack and passed away. It is an insidious disease that catches us off guard. The attack more often than not occurs in the morning. This is what one expert Dr Imran Arif MD has to say. Cortisol is a hormone produced by the adrenal gland. It is often referred to as the “stress hormone” as it is involved in response to stress. Is stress the main cause of heart attacks? We all experience stress one time or another. Some of us cope better than others. I would say that stress acts as a trigger. We may not be aware that one or more of our arteries are clogged up when we are under stress. We can be stressfully going about our business of living not knowing that we could be a ticking time bomb. Stress itself does not increase cholesterol levels. How does LDL (bad cholesterol) clog the arteries in the first place? Modifying your diet can greatly improve your health – and your cholesterol levels. Reducing the amount of saturated fat and increasing the amount of fiber in your diet can help you to keep your cholesterol levels within normal levels. This means minimizing the junk food and fast food in your diet, and increasing your consumption of fresh fruit and veggies. Lets call them 'bad food'. Consuming bad food increases triglycerides levels that acts like a glue which binds bad cholesterol to the walls of our arteries. Imagine if you will our arteries as drains, blood as water and bad food as rubbish. If everyone keeps throwing rubbish into drains, it will eventually clog. And that is why we have floods in Malaysia every monsoon....I am deviating but I think that the analogy applies. So what can we do? Once in a while, I succumb to minor temptations. Don't we all? The key is to eat such foods in moderation and less frequent. Let's face it. It is impossible to avoid them altogether especially if you are working full time, love to eat or have a sweet tooth. Exercise or not at all. By adding exercise to your daily routine, you can modestly lower your LDL and raise your HDL, or "good" cholesterol. There are many types of exercise that you can use to lower your cholesterol, so whether you’re a seasoned athlete or a recovering couch potato – there is an exercise regimen out there just for you. Additionally, it will help you to lose weight. I used to exercise. After having three kids and injuring my knee from a bad fall, losing the weight became tougher. Most of us know that we need to regularly cleanse externally as well as internally. Regular exercise removes excess toxins and prevent water retention through sweating. I was searching for the right motivation to kick start. And now I do. Quitting smoking now can lower your cholesterol levels, as well as help boost your good cholesterol (HDL) levels. Out of curiosity, I have taken a puff once in my lifetime and disliked it. Non-smoking section for me. Do you have a parent who has high cholesterol? Do you have a parent or sibling in your family who had suffered from a heart attack early in life (younger than 65 years of age in women, or younger than 55 years of age in men)? If so, you’re at risk for having high cholesterol and heart disease, too. Genes alone can up your risk. Coronary heart disease risk begins to rise when men are in their forties. This is thought to be due to elevations in LDL cholesterol around this time. Women are relatively safe until they hit menopause, when LDL levels go up. High LDL levels being present could also increase your risk for heart disease. Good news for the woman. Bad news for the man. I could be wrong but my guess is that men in their forties are more stressed out juggling family, financial, work problems or all three. Now that is a triple threat. If he bottles it all up, he would more likely than not suffer a heart attack. The older you get, the higher your risk is for having high cholesterol. High cholesterol, especially high LDL levels, can lead to atherosclerosis. And, as the cholesterol continues to deposit on the arterial wall to form a plaque, it can obstruct blood flow to important areas of the body -- including the heart. According to the guidelines set forth by the National Cholesterol Education Program, men that are 45 years old or older and women 55 years old or older are at an increased risk for having high cholesterol. Everyone ages. The key is to age with a healthy heart. The rest of our organs will follow suit. When our arteries are clog free from bad cholesterol, the blood that carries essential nutrients can be easily absorbed. This in turn makes our external body healthy and strong. It makes sense, doesn't it? There are so many types of health juices flooding the market. These days, consumers are very health conscience and they are spoiled for choice. Commercialized products are generally expensive. Marketing, packaging, transportation, advertisements, commissions foreign currency rates and intermediate parties to name a few increases cost. To consume such products on a long term basis could burn a hole in one's pocket. Personally, I have been spending a few hundred ringgit every month on health supplements. Is there another alternative? Consider homemade. Why? Well, why not? Of course time and some elbow grease is required. The work comes from the preparation but it is worthwhile because the ingredients are all natural and pure. They can be bought in any fresh food market. The cost is comparatively low to what I spend every month on over-the- counter supplements. I can also be confident that there are no added sugars, artificial preservatives and coloring. The natural juices not only protects the arteries, it also protects the heart. The proof is in the pudding. Get your blood tested first. Take the juices accordingly. Take another blood test one or two months later for comparison. If you or your family member or friends have hypertension or diabetes or both, it is all the more reason to do the blood test regularly. Do it for your own sake and for the sake of your loved ones. Do not wait until it is too late. Even if the result is negative for bad cholesterol, our bodies would still need supplements to maintain a good cholesterol level as we age. Do you have high cholesterol or blocked arteries? Are you now in your forties and above? Are you are searching for a health juice that will not cost you an arm and a leg, is fresh, natural and pure? Please take some time to consider the benefits of these juices which can improve your quality of life. And if you know of anyone who is at risk, please share this information with them. You could be saving their lives. I have a passion for art and drew this portrait from one of the many pictures of babies I found online. Babies make adorable subjects to draw. Their eyes reflect innocence and purity. I added leafs to complete the drawing. The medium is 2B pencil on Wedgewood paper. Hope you like it. Hi! I've read about this other places and found your blog while searching for personal testimonials from actual people as to whether this works. You mention the ingredients but I was wondering if you could share the actual recipe and preparation instructions? My apologies. I only realized that I have posted my reply in a new comment instead of clicking the reply button. To answer your query, please click on the link that says, "How to prepare natural juices" which is right after the end of this article or you may scroll up to the tabs and click "Health Topics" and select the said title. Good Luck and Thanks for dropping in. You may click on the link that says, "How to prepare natural juices" which is right after the end of this article. I tried it out for a month. The blood test result shows no improvement over the result a year ago. I don't know what is your medical history or lifestyle and food choices.Your body may require a longer period to detox. And as you can see from the blood test reports for my hubby it did work. He does not smoke and is a social drinker. He does have high blood pressure but is taking medication and under control. His weight is within the acceptable range for his height and weight. If you can, please continue for a period of 3 months and do another blood test. Good luck and Thanks for the feedback. Can you pls share how do you make the garlic and ginger juice? Do you mix with water and blend if you dont have a juicer? Do you need to sieve afterwards? "How to prepare pure natural juices"
I buy garlic and ginger paste already premixed in bottles from Mustaff supermarket. Then pour the content into a stainless steel sieve and use a spoon to press on it to get the juice. For lemon juice, I dont buy the bottled type as it is diluted with too much water I think. That will surely cut down the preparation time. Thank you for sharing.